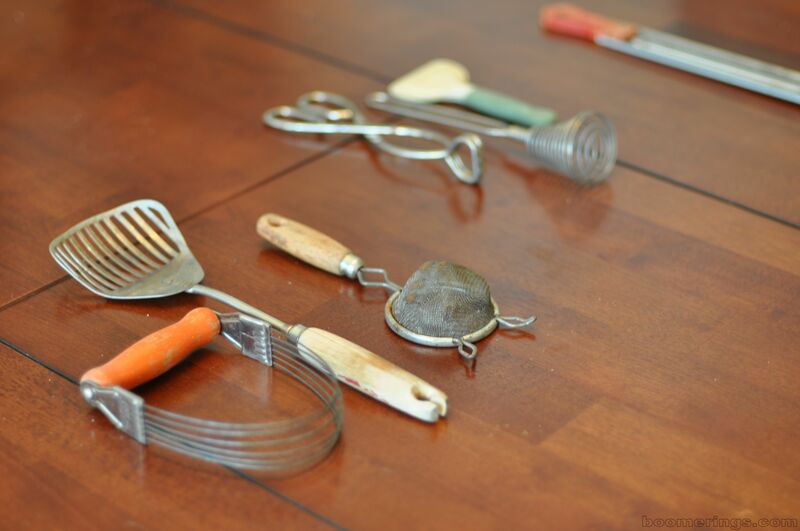 This collection of old kitchen tools has been stored in a box for many years. 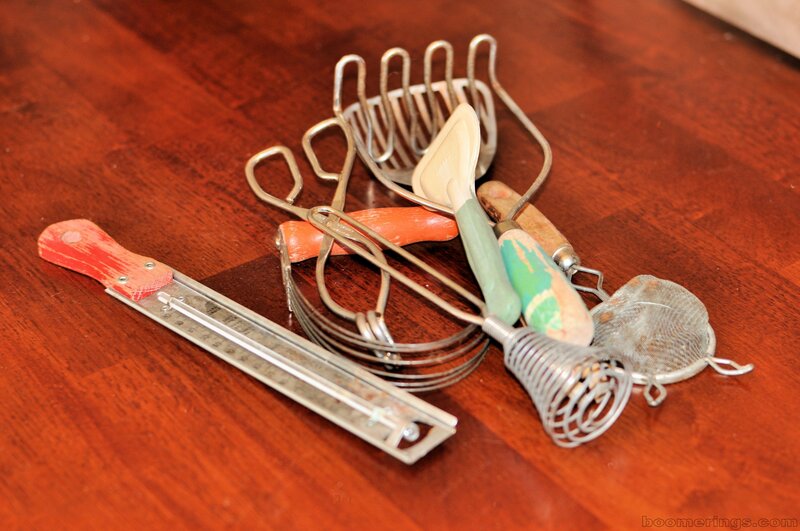 They once belonged to my mother and grandmother and were long past their usefulness in the kitchen, even if I could get through all the rust. Keeping things like this always presents a dilemma. There is some sentimental value here even if there is little practical value. I don’t know where I first saw the idea of hanging a frame around 3D objects, so I can’t credit anyone. I’m grateful to that person. It’s the perfect answer for what to do with my vintage finds. I laid out the tools on my table, grouping and regrouping them, until I had a pleasing arrangement. Next, I measured the groupings for length and width, so that I would know the inside dimension of the frame I would need. The nearest second-hand store had plenty of frames to choose from. I took a tape measure with me so that I could measure the opening of each frame. I tossed the frame contents, saved the glass for another use (which is still unknown at this time), and with a little acrylic paint, I made them a set. 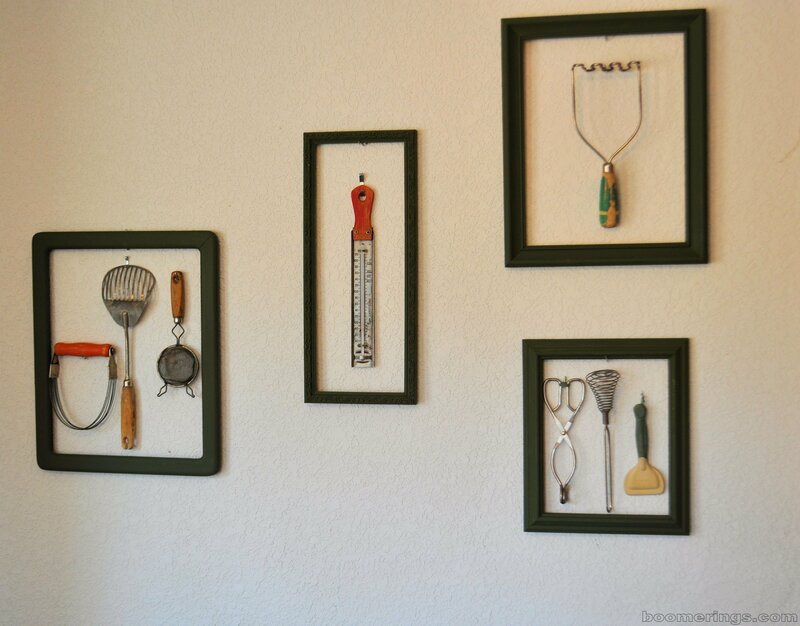 Now, those tools grace the wall in my kitchen. They no longer have to hide in a box and I don’t have to wonder if I should keep them at all. I still don’t know if it’s art. Posted on March 17, 2015 by Twain FarePosted in Frugal SolutionsTagged DIY, frugal living, home dec, kitchen tools.